Following the Revolution, an eleven-year-old boy becomes the captive of a ruthless man who has set up his own "nation," supported by piracy, on a remote part of the New Jersey coast. 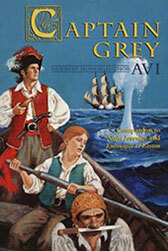 Young Kevin Cartwright is the prisoner of a pirate king. "I shall find a way to get free." "Free!" he shouted. "You are here, with us now. You can forget about your father and your sister, or anybody else you may have known. You belong to no nation but this nation. Put him back where he was and don't feed him. Tomorrow we shall talk again about freedom!" In the summer of 1975, I was working as a librarian, and trying to write. My first two books had been published. But, still needing to work full time at something other than writing, and having worked at the New York Public Library for about ten years, I took a librarian’s job at Trenton State College (now The College of New Jersey) where I was hired as a reader’s adviser, with a focus on the arts and literature. It was a somewhat unusual position insofar as I was a member of the faculty which, among other perks, meant I would have my summers off—to write, of course. That’s why I took the job.